The UCI Track Commission has clarified their position on rider eligibility for Team Pursuit and Team Sprint events. While there isn’t a specific article stipulating the integration of an older rider in a team of another age category, the Commission stated that a team may enter an older rider in a team, as long as the majority of the team participants’ ages are in the relevant age category. Thus, in Team Sprint, two of the three riders must be the correct age of the age category, and in Team Pursuit, at least three of the four riders must be within the correct age group. A maximum of one rider in each team may be older than the age category. Depending on entries, the age categories could be regrouped to include several age groups. In that case, the same rule applies: the majority of riders must be within the defined category. Only one rider on the team is permitted to be above the age category of the team. All riders planning on competing in the Team Sprint event at Masters World Championships should take note of the updated UCI regulations related to rider positioning on the track. The lead rider must cross the pursuit line first and must pull off above the sprint line no later than 15 meters beyond the pursuit line. Also, pushing between members of the same team is strictly forbidden. 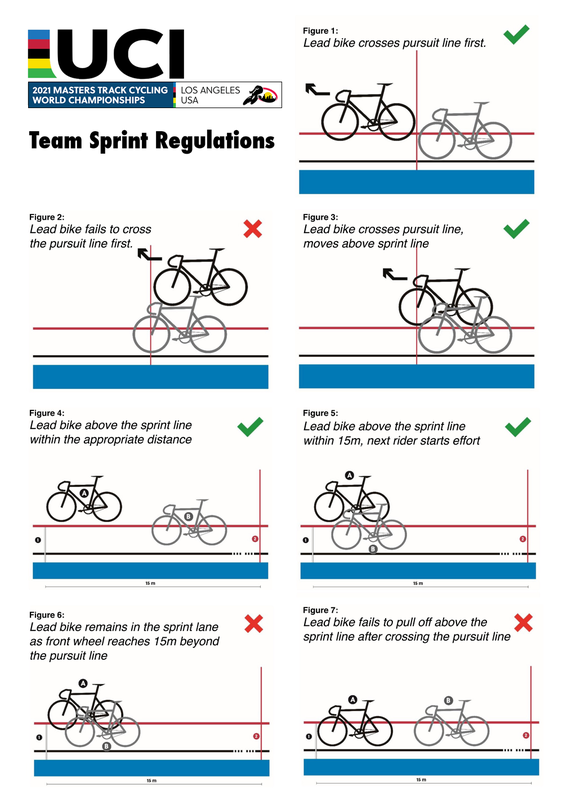 Failure to comply to Team Sprint regulations could result in relegation or disqualification. Please refer to pages 31-36 of the UCI regulations handbook: http://www.uci.ch/mm/Document/News/Rulesandregulation/16/26/54/3-PIS-20170701-E_English.PDF. UCI World Masters Championships are typically organized in age groups of five years (e.g. 35-39, 40-44, 45-49, etc). These categories can be divided in age groups of less than five years or regrouped with adjoining age groups based on number of participants in each event, in which case one single classification shall be drawn up. There will be no separate race for an age group if there are less than six eight participants in individual events, or less than 12 participants in a mass start event (e.g. the points or scratch races) or less than 8 participants in the other events. For team events, a majority of the riders of a team shall have the same age group. Only one rider maximum in each team may be older than the age group. For women, we will be adding two categories for Team Events: 35-54 and 55+. Riders will compete in one of the two categories based on their age classification. The majority of the team must be within this age classification (see rule above). So, two of three riders must be the correct age category. Medal ceremonies will be held only for categories with at least eight participants. In cases of fewer entries, age group categories can be combined for a single medal ceremony for the established age category. It is important to note that eight is the benchmark. For example, if there are eight riders in men’s 65-69 and eight in men’s 70-74 categories in a combined points race (16 in the race), we will hold two separate medal ceremonies for the two categories. In previous World Championships, mass start events have included multiple age categories, with a single championship event but separate medal ceremonies for the established age categories. This will be clarified once entries for the World Championships are confirmed. The Sprint events will be run differently at the 2017/18 Masters Track Cycling World Championships than we’ve done in the past. As always, the competition will begin with a qualifying round consisting of a 200m flying start time trial to organize seeding for the sprint competition. Only the top 12 times in each category qualify for the sprint rounds. The remaining riders will be placed according to their seed times. In the 1/8 finals, there will be six match sprints with two riders each, determining six winners to move on to the 1/4 finals. The repechage round will have 2 heats of 3 riders to determine the remaining two riders that will move on to the 1/4 finals. All finals from this point on will be run as the best of three. The 1/4 finals will feature four heats of two riders each to determine the final four riders to compete in the 1/2 Finals. Winners of the 1/2 Finals will go on to compete in the Gold/Silver round, while the remaining two will compete for Bronze. Check out UCI regulations for more info: http://www.uci.ch/mm/Document/News/Rulesandregulation/16/26/54/3-PIS-20170701-E_English.PDF. All riders 35 years old and older are entitled to participate at the UCI Masters Track Cycling World Championships (Article 3.9.001 of the UCI Code). At this point, riders do not need to hold a specific “Masters” license in order to compete at the World Championships. 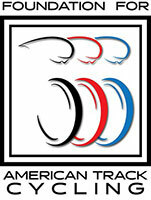 Thus, riders with an Elite license, aged 35 and over, may compete at Masters World Championships. Furthermore, participating in the Masters World Championships does not prevent any rider from participating later in the Elite World Championships. This rule will change for 2018. Riders should be aware that for next year’s Masters World Championships, all riders will be required to hold a specific Masters license in order to compete. The UCI License now must contain a UCI ID, not the country birthdate code you indicate. This consists of an 11 digit code issued by the licensing federation and if it is missing, it should be requested prior to the event.